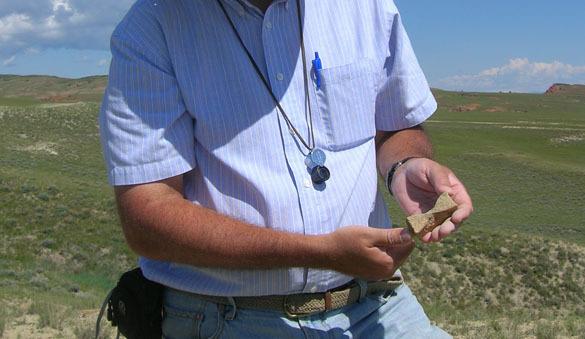 Finding the ichthyosaur bones on June 23, 2008. Image courtesy of my friend Paul D. Taylor at the Natural History Museum. 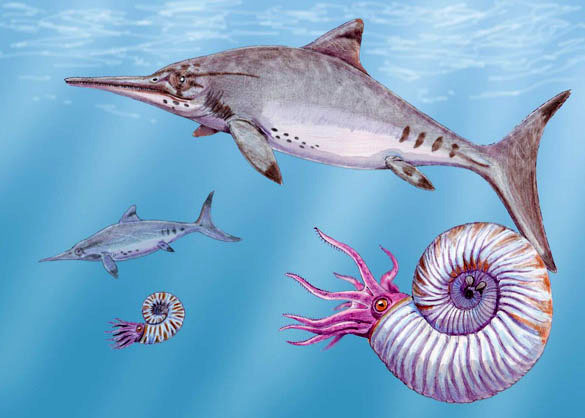 Ophthalmosaurus reconstruction (along with some nice ammonites) from Wikipedia. Image Creator: Dmitry Bogdanov. Ichthyosaurs were magnificent animals that were contemporaries of the dinosaurs. Ichthyosaur means “fish-lizard”, but they were neither fish nor lizards but a unique type of marine reptile. Their streamlined bodies are excellent examples of convergent evolution with the unrelated dolphins and sharks. Ophthalmosaurus is best known for its very large eyes, up to 10 cm in diameter, with protective bones called sclerotic rings. They probably used these eyes to see in deep, murky waters, or they hunted prey at night. 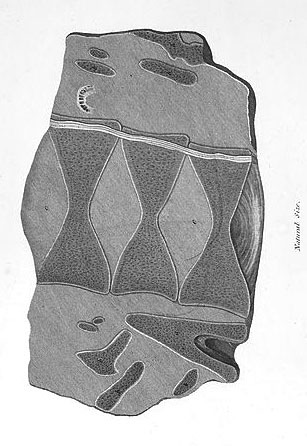 This view of vertebrae cut in half is from the first paper to describe ichthyosaurs: Home (1814). You can see the distinctive figure-8 shape, known professionally as “cupped vertebrae”. The ichthyosaur specimen Home presented was found by the famous Mary Anning and her brother Joseph. Home thought the animal was some kind of odd fish. Home and the Annings had much more than just these vertebrae, but I like the symmetry of their big discovery and my little one. 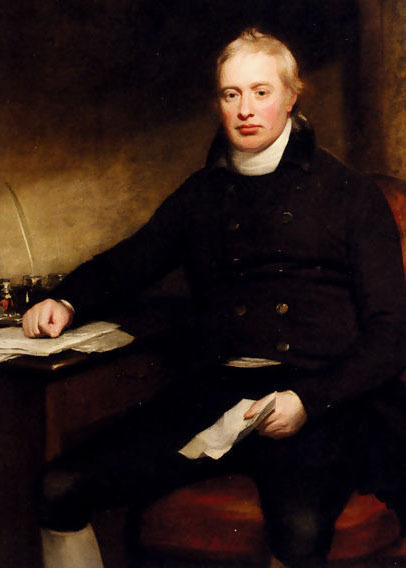 Sir Everard Home, 1st Baronet FRS, 1756-1832, was a British physician fascinated by anatomy. Besides the ichthyosaur, he is also known for the earliest anatomical work on the platypus. Home, E. 1814. Some account of the fossil remains of an animal more nearly allied to fishes than any of the other classes of animals. Philosophical Transactions of the Royal Society of London 104: 571–577. Huene, F. von. 1922. Die Ichthyosaurier des Lias und ihre Zusammenhage: Berlin (Gebr. Bonrntraeger), 114pp. 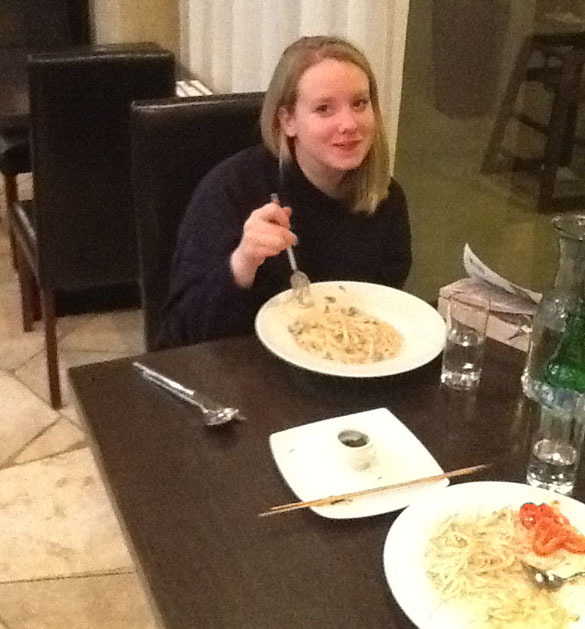 Maisch, M.W. 2010. Phylogeny, systematics, and origin of the Ichthyosauria – the state of the art. Palaeodiversity 3: 151–214. Marsh, O.C. 1879. A new order of extinct reptiles (Sauranodontia), from the Jurassic Formation of the Rocky Mountains. American Journal of Science, 3rd series, 17: 85-86. O’Keefe, F.R., Street, H.P., Cavigelli, J.P., Socha, J.J. and O’Keefe, R.D. 2009. A plesiosaur containing an ichthyosaur embryo as stomach contents from the Sundance Formation of the Bighorn Basin, Wyoming. 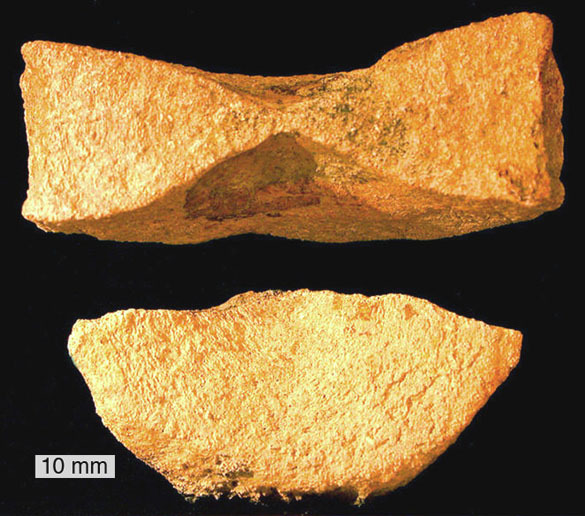 Journal of Vertebrate Paleontology 29: 1306–1310.